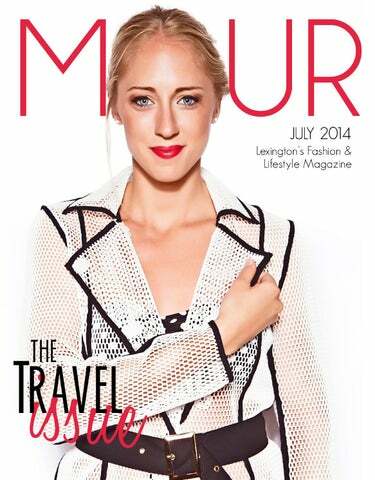 DEAR READERS, Here at MOUR, the month of July is all about travel. Whether you’re up for a stay-cation, road trippin’ or jet setting to your favorite beach. Even fantasizing about your dream vacay counts! In planning this issue the MOUR team reflected on how travel used to be, especially air travel. A flight was something you dressed for, totally glammed up. We laughed knowing, today, most everyone’s thoughts surround one concern: “Just how comfortable can I possibly be?” Yes, some of us rock PJ’s to the airport. Don’t judge! For those who like to stay near home we’ll share a few locations perfect for your next road trip that are just ‘Within Reach’, page 34. Fret over packing? Not to worry, contributor Andrea Schurr shares a few helpful hints on what and how to pack for any trip in our regular segment, ‘Watch N Learn’, page 33. And you definitely don’t want to miss our two guests of the issue: Allison Johnson, stylist and blogger of Pink Lou Lou, page 28, and Louisville based model and make up artist, Catherine Jones Kung, page 26. 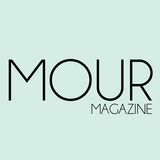 Where ever your destination and whatever your travel plans this month, grab your MOUR, relax and enjoy! resort this summer? Want to feel like you’ve just returned from international travels? You’ve gotta try these bold patterned pieces! Itâ&#x20AC;&#x2122;s so exciting to see everyone out, enjoying a beautiful Kentucky day, supporting local businesses and dressed to the nines! Weâ&#x20AC;&#x2122;re loving the high-waisted bottoms, pops of color and fun patterns! CALL US TODAY TO ENROLL IN OUR FALL PROGRAMS! be comfortable without sacrificing your fashion choices.” For vacations, the destination helps plan her outfit. Going south means a maxi dress, light jacket and scarf for the plane. Something easy she can shed when arriving in a warm destination. For business, her staple outfit always includes a basic blazer and flats, never knowing when she may have to run to the next flight or immediately to a meeting upon arrival. Missy recently went to Punta Cana with her husband. “Comfort is key,” she said when I asked her about her outfit coming home from vacation. Despite the destination, she is always in yoga pants, a t-shirt and always has a sweatshirt on hand for the chilly airports and on the plane. Vickie also dresses for comfort, but her outfit is strictly based on where she is travelling. Being one of the lucky ones, you know, the kind that are retired and travel only for pleasure, she has no agenda. Therefore, you always have to be ready for dinner after travel. Or not having luggage when you arrive. Being prepared is key and Vickie is always prepared, well, to look good that is. While comfort seems to win the majority vote in choosing an outfit for airport travel, I think we can all agree it can get cold. Layer it up and be prepared for the weather at your final destination. If the thought of dressing down for the sake of comfort is a complete faux pas in your fashion book, which by the way is completely acceptable, you can follow the latest street styles in your arrival city on Streetpeeper.com. From Savannah to Manhattan to Milan, you can see the hippest trends on the street. No matter what, be you and enjoy your journey. Happy Travels. A self-proclaimed awkward art school girl turned makeup artist, actor, designer and model—I’ve just described Catherine Jones Kung of Louisville. She has worked with companies such as Churchill Downs, Lexus, the Miss America Organization, Rodes and Sophisticated Living. Her work has graced the pages of People Magazine and Sports Illustrated. She even appeared in the 2014 movie 50 to 1. How does one go from being the girl with self-esteem issues to traveling the country, meeting inspiring people and in turn inspiring confidence in others? It takes a combination of innate passion and constantly pushing oneself beyond perceived limits. Use oil absorbing blotting papers instead of powdering, or prior to powdering. It will keep your makeup for becoming cakey and clogging pores. Use an eyeshadow primer to keep colors from creasing and melting. I recommend Urban Decay's Eyeshadow Primer Potion. I won't even wear eyeshadow if I can't wear this underneath it! Use lip stains under glosses for a fresh look that lasts. The Blog Spot Allison, I love following your blog Pink Lou Lou! You talk about it all, from weddings to hair. What inspired you to begin blogging? I started blogging after I called off my wedding. It was the craziest time of my life; I didn’t know anyone who had done that. I always liked writing and my friends had encouraged me to start possibly blogging. So I started to write about my experience with calling the wedding off and ended up meeting a lot of girls who had been through the same thing and how they got through it. So that’s how it started…writing to no one, because no one reads it at first, haha! You have the dreamiest closet and now I know why you are a selfproclaimed heel advocate. What is your favorite pair you own? I call them my “Carrie Underwood Heels” because they are glittery and about 5 inches…they’re actually Jessica Simpson’s brand but I call them my Carrie shoes, because it looks like something she’d wear. Why she hasn’t come out with a shoe line is beyond me! You keep a pretty in Lexington? her travel tips for our readers this month. is your favorite travel destination? A favorite vacation spot of mine would probably be Rosemary Beach in Florida. It’s a really small and cute community. The Truman show was actually filmed in seaside down there. I am also getting ready to go visit my sister in Hawaii for the first time! But my dream vacation is Bora Bora! I WILL go one day and stay in one of those huts on the water, Haha! MOUR HEALTH & BEAUTY BROCCOLI This one may not sound as delicious, but broccoli is packed with chromium which is a very important nutrient that controls the level of insulin in your body. Research shows if chromium is consumed within two hours after a workout you can increase the amount of glycogen (a form of energy storage) in your body. CHOCOLATE MILK No youâ&#x20AC;&#x2122;re not dreaming, I said chocolate milk! Chocolate milk is a great post work out drink because it is packed with double the carbohydrates and protein content than other drink options such as regular milk or a sports drink. PINEAPPLE Pineapple is high in vitamin c which is a key component in repairing tissue. It also contains bromelain which is a natural anti-inflammatory, so it can help heal bruises, sprains and swelling. CHICKEN & BROWN RICE This is a more filling after workout snack than the yogurt, and is just as effective. It is shown that eating carbohydrates and protein together after a workout yields the best results for building muscle. Brown rice is also a great source of fiber and is filled with complex carbs to fuel the body. Brown rice has tons of benefits that go beyond helping your workout, itâ&#x20AC;&#x2122;s been known to protect against heart disease, type 2 diabetes, and cancer. YOGURT WITH FRUIT Low-fat yogurt provides a large dose of protein. After a workout your muscles will be depleted of amino acid, protein helps replace the lost amino acid which helps you build muscle. The fruit provides fiber, vitamins and carbohydrates to regain energy. Is it a bar? Is it an arcade? Luckily for us Lexingtonians, it’s a great combination of both! Local craft beers and well mixed drinks on one side, vintage arcade games on the other. Help Frogger make his way across a busy highway or swamp while sipping a Moscow Mule. Save the Universe from complete annihilation while downing a West Sixth Lemongrass Wheat Beer brewed just a half mile away. The LEXSEWS project is designed to provide refugees and low-income participants with multidisciplinary educational and skill development opportunities that promote self-sufficiency through professional sewing courses which incorporate entrepreneurship. What’s up at the Collaborative? Product Development Program with Kim Barber July 12th and July 19th 11am – 3pm Email Lavernez@gmail.com to register and for more info! www.lexingtonfashion.org } Sign up for the LFC newsletter for updates on events and projects. Vacations are supposed to be all about relaxing, so why does packing have to be such a hassle? Follow these 6 easy breezy tips and tricks to get the most out of what you put in your suitcase. 1. Mix and Match: When packing tops and bottoms mix and match is the best way to make the 5. Leave the hair products/tools most out of the space in your suitcase. And luckily for travelers, mixing patterns and prints is a at home: Your hair needs a super-hot trend for summer. Leave the basics at home and have some fun with your vacation ensembles. Vacation is a great time to be a bit more adventurous with your style. To make it easier on yourself,stick to packing a general color-scheme like gemstone or earth tones. You can mix and match your bathing suit tops and bottoms too! 2. Keep your feet happy: Yes, the new six-inch heels you have been dying to wear are cute, but maybe not the best idea for plodding along through hours of sightseeing or other vacation activities. Pack the comfy shoes instead and you won’t regret it. Flat platforms are the shoes of the moment right now and offer a much more forgiving alternative than those blister-inducing stilettos. 6. Do your research & Dont stress! 3. Layers, layers, layers: Weather is always unpredictable. Packing plenty of loose layers will ensure you will be comfortable no matter what. A waffle-knit sweater over a bikini top is a super cute way to stay warm poolside once the temp starts to drop. Plus, anyone who has ever been stuck in a hotel room with a thermostat that seems to only have two settings— sauna or artic blast—knows the importance of being prepared. vacation too! Give your locks some much needed R&R from the straightener, curling iron and blow dryer. Plus, if you vacay at the beach, the salty ocean water is the all the styling product you will need (it adds great texture and enhances hair’s natural waves). This will leave you with plenty of room for souvenirs! Great weather makes for great and pleasurable driving, so pack a bag, fill up the gas tank, grab some great tunes and let the adventures begin. From a one-day escape in Cincinnati to a weekend-long trip to Savannah, here are some great ideas for some time away! Krohn Conservatory: Experience flora and fauna on a new level. The greenhouse is home to a rainforest, a desert flora, flower shows and many special rotating exhibits. Fountain Square: The heart of Cincinnati’s public life; Fountain Square offers special events, free concerts, eating contests and great architectural sights. Pack a lunch or eat at one of the local spots, Fountain Square is sure to offer something for you. Cincinnati Reds Game: Whether you’re a baseball fan or not, the Reds game is a great outing with family or friends. Carew Tower: Ride the elevator up to the 49th floor to get an amazing view of the city, the Ohio River and Kentucky. Cincinnati Art Museum: For a glimpse into the past, the museum offers major works of Ancient Art, European Art, Middle Eastern, and more importantly, local artist’s work. Otherwise known as Music City, Nashville is a short 3 hours away from Lexington. For country music lovers, Nashville is a paradise where music fills every corner of the downtown area. Country Music Hall of Fame and Museum: You can’t go to Nashville and not visit the Music Hall. When in Nashville, you’ve got to “Honor Thy Music” in order to truly understand the heart and soul of this city. Tootsie’s Orchid Lounge: One of Nashville’s most famous music bars, Tootsie’s hosts both renowned and up-and-coming country artists on a daily basis. Perfect to get your music fill to end the day or start the night, Tootsie’s is bound to have a crowd regardless of the day and time. Grand Ole Opry: Known as one of the most famous stages in the US, the Opry offers constant yearlong performances for all age groups. Having started as nothing more than a radio show, the Opry has come a long way since its early beginning in the 1920s. The Parthenon: Located in Centennial Park, the Parthenon is an architectural beauty that hosts many American artists’ work within its walls. Pair it with a visit to Vanderbilt University and you’ll be sure to give your eyes a treat with so much architecture and plenty of great views. Hermitage: Home of former President Andrew Jackson, the Hermitage will take you back in time as you take a stroll through the grounds. Slavery, everyday plantation life and the war are only a few of the topics visitors can expect to learn more about during their visit. Fort Sumter: Talk about history—Fort Sumter is the place where the first Civil War shots were fired. Although it is only accessible via water, it’s a must-see in Charleston. There are ferry rides available year-round and once you get the feel and see of some of the historical firearms, the visit will be all the more worthwhile. South Carolina Aquarium: The Aquarium is home to South Carolina’s diverse aquatic life. The displays are arranged by the state’s regions, hosting aquatic life from small fish to turtles and sharks. If you’re up to it, you can also feed stingrays and shrimp through the aquarium’s interactive tank. Old Slave Mart Museum: Located in Charleston’s Historic District, this building is the only existing building in which slaves were auctioned pre-civil war. Tough to go through, but rewarding for its message, the Old Slave Mart Museum is a great place to get a glimpse of and experience the past. City Market: Found in downtown Charleston, the market is open every day of the year. The perfect location to grab a bite to eat, buy souvenirs, people watch or simply walk around. The market will fill your day with the hustle and bustle of the city’s vendors and shoppers. Visit one or visit all, summertime is the perfect time to pack light and travel around. There’s no better way to gain knowledge, insight, perspective and love than through travel and the things you can discover when out on the road. Treat yourself to a much-deserved break, pick a travel buddy, and capture the moments that will make you grow as a person.